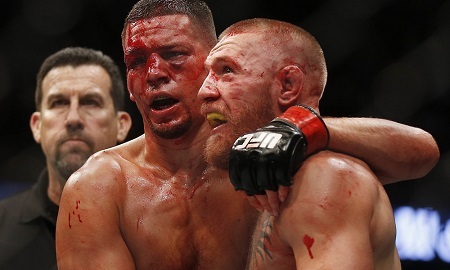 Professional MMA fighter and boxer Notorious Conor McGregor says he owes the third fight to MMA fighter Nate Diaz, and that their legendary trilogy fight will take place. Conor McGregor was at Binny's Beverage Depot located in Chicago when he addressed his fans about the third match that needs to take place. I have nothing but respect ... I owe him the trilogy now and the trilogy will happen. Conor McGregor when against Nate Diaz for the first time in March 2016 at the UFC 196 where the Notorious one was choked out and submitted. Nate agreed for a rematch in August 2016, where the previous rivals faced each other at UFC 202. The match went in Conor's favor which he won by a 5-round major decision. There have been rumors about the third fight since 2016, but Conor has been busy fighting bigger names like Khabib Nurmagomedov and Floyd Mayweather. The MMA fighter is just 30 years of age and wants a rematch with both Khabib and Floyd, but Conor hinted that his trilogy with Nate Diaz, is what he is looking forward to. UFc might be excited too for the event as the previous matches were quite a hit in the history of UFC's pay-per-view, the first match being on the 3rd while the second edition of the fight is the second biggest. Denis Akiyama, 'Johnny Mnemonic' and 'Pixels' Actor, Dies at Age 66: Cause of Death?